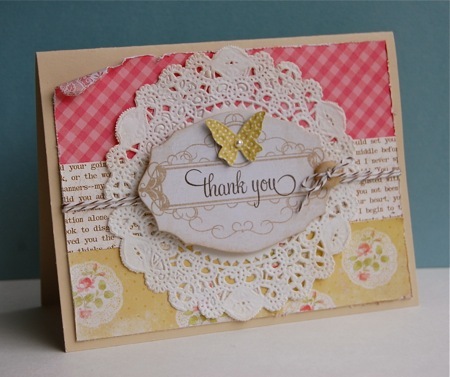 Your construction of your card is beautifully done; from the Bg papers to your added script trim, the doily which is giving out so much texture, then your eye catches the twine,your framed sentiment-to the Yellow butterfly, altogether a soft shabby feel and a perfect Thank-you card. Thank you so very much for joining us this week at Our Creative Corner I am just thrilled to view your work. Another AWESOME Shabby chic card. You sure do have the knack for these types of cards girlfriend! LOVELY!!! what a beautiful card! I love the different pattern you put together. they work so well! the doily and bakers twine really help bring this card to life! thank you for playing along with us @ OCC. so glad you could join us! your work is beautiful! Such a pretty card - I so love the CAS look - beautiful.